Surfboard Rentals Waikiki | Hawaii Surfboard Rentals | Free delivery! Hawaii Surfboard Rentals | Free Delivery! Waikiki surfboard rentals with free delivery islandwide! We are a mobile surfboard rental company in Waikiki serving Honolulu, Hawaii with islandwide surfboard drop off and pick up since 2005. Our surfboard rentals are in excellent condition and renting at some of the best prices from Waikiki to North Shore to Ko Olina, so reserve today! Click here to check out our surfboards! We rent paddle boards, soft racks, coolers and beach chairs too! Whether surfing for your first time, just coming off a surf lesson or you've been surfing since the grom days, these tips and advice are sure to help when renting a surfboard in Honolulu, Hawaii. A longboard is the best choice for a surfboard rental in Waikiki. The waves at most main Waikiki surf breaks tend to be long, lazy and rolly so a bigger surfboard than you normally ride would help to ensure an increased wave count, easy paddle, longer ride and an upper hand when competing against other longboard surfers and stand up paddle board surfers in the lineup (“lineup” – the area where the waves normally begin breaking. Surfers sit on their boards in the lineup and wait for waves to break). 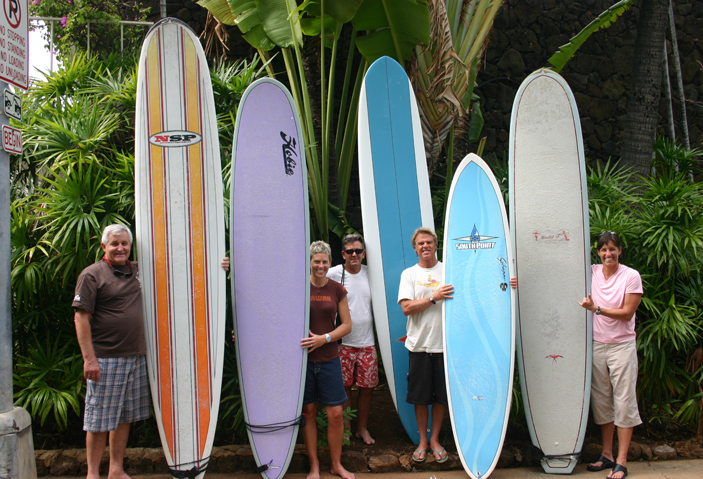 The most common size surfboard for Waikiki is between 8'0" to 12'0". If you're coming off a surf lesson or teaching yourself for the first time, we highly recommend riding a surfboard at least 9ft. long. Novice surfers over 6 ft. tall and/or 200 lbs. should ride a surfboard at least 10ft. long. Longer surfboards, known as longboards, have much more buoyancy and stability than shorter surfboards which in return will give novice surfers a much easier and enjoyable time surfing for his/her first few times. Also, expect a much longer ride as longboards produce much more glide than shorter boards. A longboard is highly recommended for a Waikiki surfboard rental. 95% of our current surfboard rental inventory are of epoxy construction. Epoxy surfboards are stronger and lighter than traditional poly fiberglass boards plus more ding resistant. Expect more buoyancy and easier turning with an epoxy surfboard. The EPS foam used in our surfboards will not absorb water as fast as a poly fiberglass surfboard. During Hawaii's summer season (June - September) most waves can be found on Oahu's South shore such as Waikiki, Alamoana, Diamond Head and White Plains beach. During Hawaii's winter season (October - February) most waves can be found on Oahu's North and West shores such as Haleiwa and Makaha. Hawaii Surfboard Rentals delivery service runs from Waikiki to Ko Olina to Haleiwa and more! Free islandwide delivery with a minimum 2 day rental or $100 minimum order for certain areas. We rent vehicle soft racks! Transporting surfboards on a vehicle soft rack is safe and easy when correct measures are followed. Soft racks should be placed evenly apart on roof of vehicle to prevent any sort of "see-saw" effect from surfboard. Lay surfboard with fin forward and pointing up to the sky. Fins forward will ensure that even in the worst case scenario of your straps coming loose due to strong winds, the fins will prevent your surfboard from slipping out through the straps. Never exceed speeds of 55mph when driving with surfboards strapped to the car. Hawaii Surfboard Rentals is located in Honolulu and is a mobile surfboard rental service offering convenient free surfboard delivery and pick up to homes or hotels in Waikiki, North Shore, Haleiwa, Turtle Bay, Ko Olina, Ewa Beach, Laie, Hawaii Kai and more. We rent surfboards in excellent, well maintained condition at some of the lowest rental rates in Honolulu, therefore you save money renting from us instead of lugging your own board to Hawaii or renting from an over priced surf shop or beach stand.